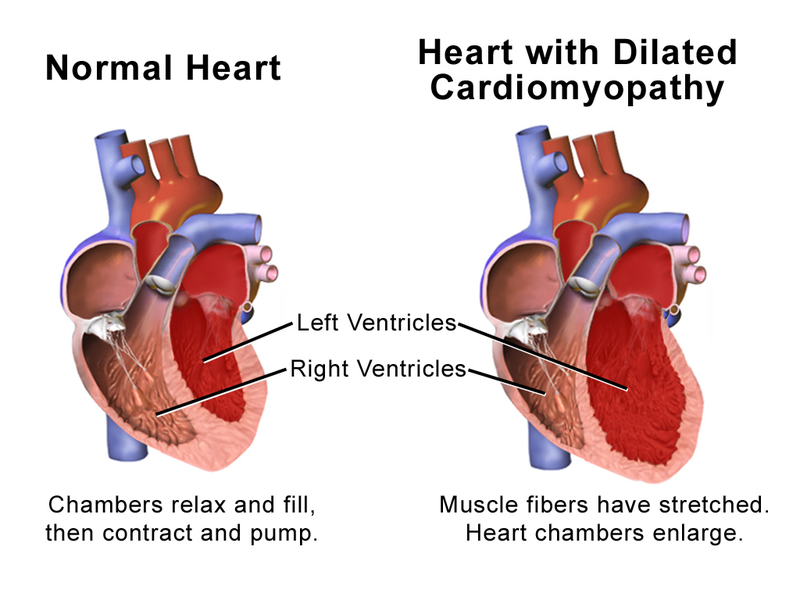 Cardiomyopathy literally means disease of the heart muscle. Canines suffer from two types of cardiomyopathy: dilated cardiomyopathy and hypertrophic cardiomyopathy. The first, dilated cardiomyopathy (DCM), is by far the most common type found in dogs. Canine dilated cardiomyopathy is commonly referred to as an enlarged heart in dogs. In this condition, the cardiac muscle walls progressively weaken and lose their ability to contract properly and pump blood efficiently. This leads to poor circulation and increased pressure in the heart and blood vessels, which causes the heart to stretch even more. When the heart becomes enlarged, the valves are unable to close completely, allowing blood to flow backwards when the heart contracts. This creates a heart murmur which can be heard through a stethoscope. Other effects from an over-stretched heart include an irregular heart beat and heart failure. While both the upper and lower chambers become enlarged, one side may be more severely affected than the other. When the lower chamber becomes enlarged, its ability to pump blood to the lungs deteriorates, allowing fluid to accumulate in the lungs. The incidence of dilated cardiomyopathy increases with age, usually occurring between the age of four and ten, although Portuguese Water Dogs can develop the disease at a young age. In most breeds, male dogs are more susceptible to the disease than females. Hypertrophic cardiomyopathy is a heart disease characterised by the thickening and stiffening of the walls of the heart muscle, leaving the heart chambers smaller than normal. This can lead to the decrease of blood flow and volume, an accumulation of fluid in the chest and lungs, and the formation of blood clots. Hypertrophic cardiomyopathy is much rarer in dogs than dilated cardiomyopathy. 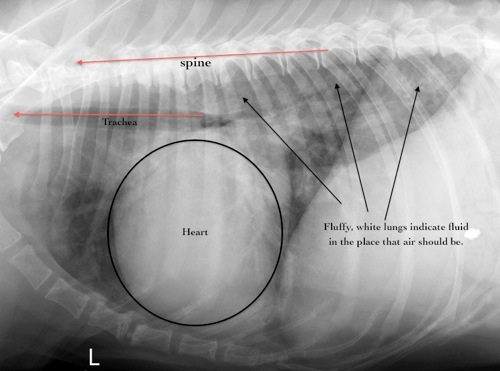 There is a very long early phase of dilated cardiomyopathy in dogs, during which no obvious signs are exhibited and the dog may appear to have normal health. Signs then become evident for a relatively short period of time, giving the appearance that the development of heart disease has occurred very quickly, although it has in fact most likely taken many months or even years. Symptoms of later onset, such as difficulty in breathing and coughing, are typical signs of congestive heart failure. Sudden death – collapse and sudden death occur in as many as 20% of Doberman Pinschers with the disorder. The cause of cardiomyopathy, or an enlarged heart in dogs, is largely unknown and the disease is usually considered to be idiopathic, meaning that it arises spontaneously with no identifiable cause. Nutritional deficiencies could be a contributing factor. Deficiencies of certain amino acids have been found to correspond to the incidence of dilated cardiomyopathy in certain breeds, for example, a taurine deficiency has been identified in Dobermans, American Cocker Spaniels, Golden Retrievers, Dalmatians, and possibly Welsh Corgis and Tibetan Terriers. Carnitine-responsive cardiomyopathy has been reported in Boxers and Doberman Pinschers, but is extremely rare. Cardiomyopathy can also occur as a result of other diseases (such as a heart infection), medications (such as certain anti-cancer drugs), or exposure to a toxin. In these cases, they are usually called secondary myocardial diseases. In addition to a thorough physical examination of the heart, certain medical tests are needed to confirm a diagnosis of cardiomyopathy and determine the severity of the disease. Diagnosis of both dilated and hypertrophic cardiomyopathy make use of radiography and heart ultrasound. In some cases, dogs with pre-clinical (prior to the appearance of symptoms) dilated cardiomyopathy may be given a questionable diagnosis because they appear to be in good health. 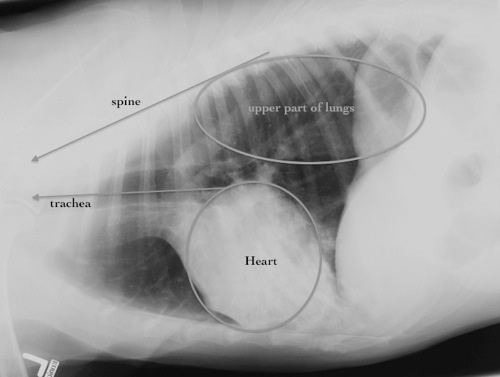 Radiographic imaging (X-rays) of the chest may reveal if the chambers of the heart are enlarged, and the presence of fluid in the lungs. Echocardiography (an ultrasound of the heart) is generally considered the ideal test for a definitive diagnosis of cardiomyopathy, because it characterises the physical changes in the heart muscle. This test examines the size of the heart and the its ability to contract. If dilated cardiomyopathy is present, an echocardiograph will reveal an enlarged left ventricular and left atrial, and low contraction ability. Echocardiography can be used for early detection of dilated cardiomyopathy in breeds that are at a higher risk of contracting it. An EKG may show electrical disturbances of the heart, such as arrhythmias or atrial fibrillation and ventricular tachycardia (rapid beating of the heart), or enlargement of the left atrium and ventricle. A simple blood test (proBNB test) can detect a problem in the early stages of the disease by measuring the amount of peptide hormone in the blood. This hormone is only released when the enlarged heart in dogs is pushed beyond its capacity. Blood tests can also be used to diagnose a taurine deficiency cardiomyopathy in many breeds. Sadly, the life expectancy in most cases of enlarged heart in dogs is poor. Your vet will advise you on your dog’s expected prognosis, taking into account the progression of the disease at the time of diagnosis. Generally, the life expectancy is from six to 24 months. The outlook for most Doberman Pinschers is particularly poor. In the past, about 65% died within eight weeks of diagnosis of heart failure; however, nowadays medication may prolong survival for up to six months. Congestive heart failure often results from cardiomyopathy in dogs and should be treated appropriately. Dogs with severe heart failure, particularly left-sided congestive heart failure, have a worse outlook than those with milder signs or signs of right-sided congestive heart failure. Dogs that are taurine responsive have a fair to good outlook once signs of congestive heart failure lessen. Treatment for dilated cardiomyopathy in dogs is largely focused on two areas: prescribing medication for improving the heart muscle’s ability to contract and treating the symptoms of congestive heart failure and cardiac enlargement. Unfortunately, dilated cardiomyopathy in dogs is irreversible and progressively deteriorates, so the number of medications prescribed, and the dosages required, will typically increase over time. These drugs require careful monitoring for side effects, which may include vomiting, reduced appetite, diarrhoea, electrolyte imbalances, depression and kidney disease. Cardiomyopathies resulting from a lack of a particular amino acid or enzyme and can be treated by reversing the deficiency, for example, taurine deficiency can be treated with taurine supplementation. Results of this treatment can be dramatic, often eliminating the need for other heart medications. Follow-up treatment for dilated cardiomyopathy will generally entail regular progress checks. Clinical examinations such as chest X-rays, blood pressure measurements, EKG’s and biochemical tests are all standard diagnostic tools for measuring the progression of the disease. You will also need to monitor your dog’s attitude and be vigilant for outward signs of relapse, such as laboured breathing, coughing, fainting, and lethargy. Unless the dog is severely affected by the disease, long-term hospitalization should not be necessary. In severe cases of enlarged heart in dogs, your vet can advise you on ways in which you can make your dog’s life as comfortable as possible for the remainder of its life. 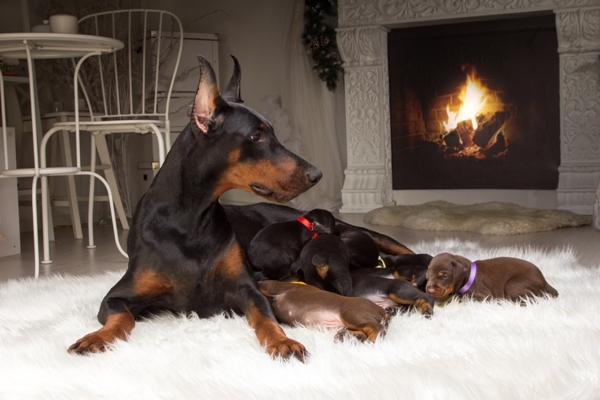 Some large breeds such as Doberman Pinschers appear to have a genetic predisposition to DCM. Canine cardiomyopathy, which literally means disease of the heart muscle resulting in an enlarged heart in dogs, can strike in different ways. Symptoms are varied, ranging from none in the early stages, to collapse and weakness, to difficulty breathing and sudden death. Fortunately, vets are often able to diagnose the disease before symptoms occur and may be able to prescribe medication to keep symptoms in check. Dilated cardiomyopathy is the most common kind of cardiomyopathy found in dogs. It is fairly widespread among certain breeds and assumed to be hereditary. Large-breed male dogs are most likely to acquire the condition and generally do so during or after middle age. Dilated cardiomyopathy in dogs is characterised by the cardiac muscle’s inability to contract properly. Poor contractility means that the heart cannot pump blood adequately, which leads to poor circulation and other complications including irregular heart rate and heart failure. Treatment comprises medication for improving the heart muscle’s ability to contract and treating the symptoms of cardiac enlargement and congestive heart failure.